The Bulldogettes picked up two district wins during Spring Break with a 15-5 win over Jim Ned Wednesday and a 13-0 victory over Stanton Thursday. The Bulldogettes and Jim Ned Lady Indians played softball during high winds and dusty conditions for the entire game Wednesday in a match that was postponed a day earlier because of severe weather conditions. The Bulldogettes took control of the game in the first inning. Cassie Grant drove a fly ball past third base for a triple and three RBI. The Coahoma senior wasn’t on base for long as Macee Grant hit a single off a 2-2 count bringing her in for the score. 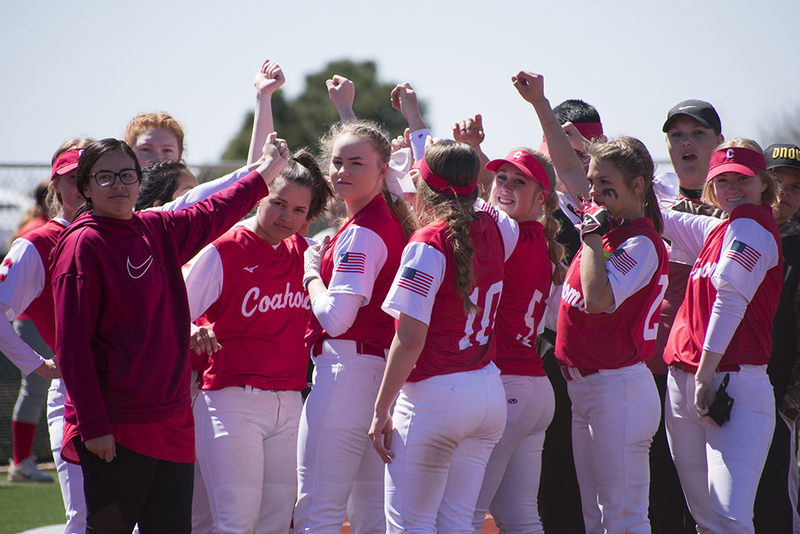 Coahoma continued to hit well scoring runs in all five innings of the game while Bulldogette pitchers C. Grant and MaKynlee Overton were effective at keeping the Lady Indians off the bases. Grant started on the mound for Coahoma and surrendered one run from three hits and struck out three over two innings. Overton came in to get the win allowing four runs from four hits and striking out one. Madison Rodgers and Jaydan Mann both hit home runs during the game. Rodgers and Mann had two doubles each. Rodgers went 3-for-4 at the plate with four runs and three RBI. Mann was 3-for-3 with two runs and three RBI. Alex Bailey and Lexi Montelongo also had a double each. Macee Grant had multiple hits to help out the Bulldogettes. W — MaKynlee Overton, L — Jenna Moore. 2B — JNHS — Libby Tutt, Malone Graham; CHS — Jaydan Mann 2, Madison Rodgers 2, Lexi Montelongo, Alex Bailey. 3B — CHS — Cassie Grant. HR — CHS — Mann, Rodgers. SB — JNHS — L. Tutt; CHS — Overton 2, Mann, Montelongo, Macee Grant, Rodgers. Pitches-Strikes: JNHS — J. Moore 79-50, C. Beasley 45-30; CHS — C. Grant 43-30, Overton 62-35. Batters Faced: JNHS — J. Moore 23, Beasley 11; CHS — C. Grant 11, Overton 15. STANTON — MaKynlee “Red” Overton pitched a shutout against Stanton to help the Bulldogettes earn their second district win Thursday. Coahoma won 13-0. The Coahoma sophomore had no hits or runs, walked two and struck out five over five innings. She faced 19 batters, threw 59 pitches and got 36 strikes. Kenzi Canales went 3-for-3 at the plate. She had two runs, 3 RBI, a double and a triple. Madison Rodgers and Jaydan Mann both knocked out doubles. Rodgers went 2-for-3 with three runs, three RBI and a home run which was her third of the week. Mann was 2-for-4 with two runs, and one RBI. Sydney Rinard and Cassie Grant had multiple hits. Next: Coahoma (7-3, 2-1) will host Anson Tuesday for a district match. Game time is 5 p.m.
W — MaKynlee Overton, L — Victoria Carby. 2B — CHS — Jaydan Mann, Kenzi Canales, Madison Rodgers. 3B — CHS — Canales. HR — Rodgers. SB — Mann 3, Lexi Montelongo 2, Cassie Grant 2, Rodgers 2, Sydney Rinard, Kaylor Green. Pitches-Strikes: CHS — Overton 59-36; SHS — Carby 95-67; Trinity Johnson 27-17. Batters Faced: CHS — Overton 19; SHS — Carby 23, Johnson 9.